In Sofia Coppola's The Beguiled, the male gaze cranks up the sexual tension within the walls of an all-girls school during the height of the Civil War. But don't think this is about the War at all. Coppola has the special ability to create little fantasy worlds that exist outside reality, where characters seem to be shielded from the outside world. 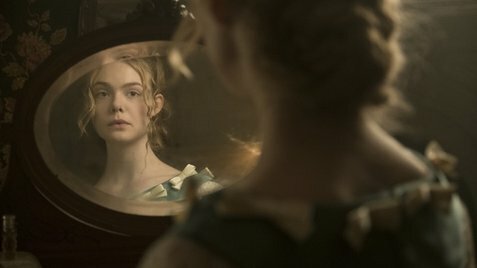 Think Bill Murray and Scarlett Johansson's Japanese romance in Lost in Translation, or the daydreaming boys of The Virgin Suicides, Elle Fanning and Stephen Dorff's hotel adventure in Somewhere, and Marie Antoinette's lavish (and pop music-infused) existence during the French Revolution. The Beguiled feels like those movies, only darker and with a touch of madness. Not quite as insane as Don Siegel and Clint Eastwood's 1971 version of the film, which took the simmering relationships within those classy walls to not-so-classy places, and made more of a statement on the Civil War and most especially on slavery. In fact, the remake has removed the two African-American women from the story completely in a move that's questionable at best, but allows Coppola to focus on her strength which is female dynamics, not racial ones. 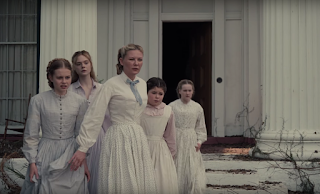 Coppola's version of The Beguiled is more expertly directed and refined, until this cultured drama sheds its skin and reveals the nutty horror underneath. 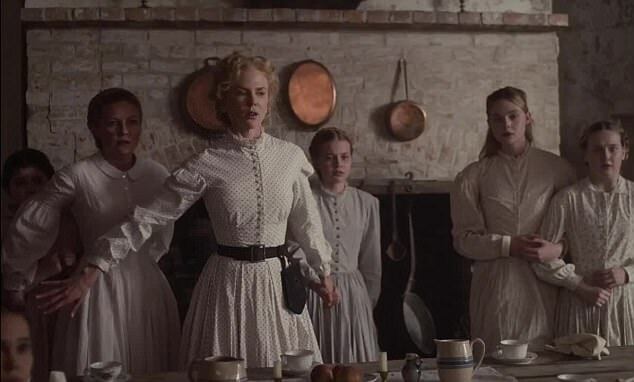 Headmistress Miss Martha Farnsworth (Nicole Kidman) leads the few young charges left at the school, keeping a stiff spine and upper lip with the war so closeby. Along with school teacher Edwina Morrow (Kirsten Dunst), they conduct classes as normal while cannon fire can be heard just outside. They exist in their own little world until the war finds its way inside when young Amy (Oona Laurence) stumbles upon injured Union solder Corporal John McBurney (Colin Farrell). With him near death, Amy decides the only thing she can do is to bring him back to the school, where Martha decides they will care for him until he's healed. Then they can turn him over to the Confederate troops as they pass by. How easily the wolf is led into the chicken coop. Like any wolf, John is different things at different times, but always there is an agenda. As the one who saved his life, Amy is the one he says is his "favorite". But he also begins making romantic overtures to Edwina, who longs for a life far away with a handsome gentleman. He becomes a confidante and drinking buddy to Martha, after wearing down her concrete defenses. And with Alicia (Dakota Fanning), who is at the age of peak sexual awareness, he sees a lustful encounter, a roll in the hay. It's a film of deep sexual repression and social hierarchy, with a mood set by ominous candlelight. The tension among the women ratchets up first between them, as John plays his manipulative games. But you wish there was more relationship between the females other than just jealousy. In her effort to streamline Thomas Cullinan's novel, and avoid some of the issues she isn't as comfortable with, she loses much of its complexity. What she does capture is the crushing sense of longing each of them experience, trapped inside by the War raging outside. And it isn't just a sexual desire burning within them, but the female desire to be free from the expectations that have been or will be placed on them. 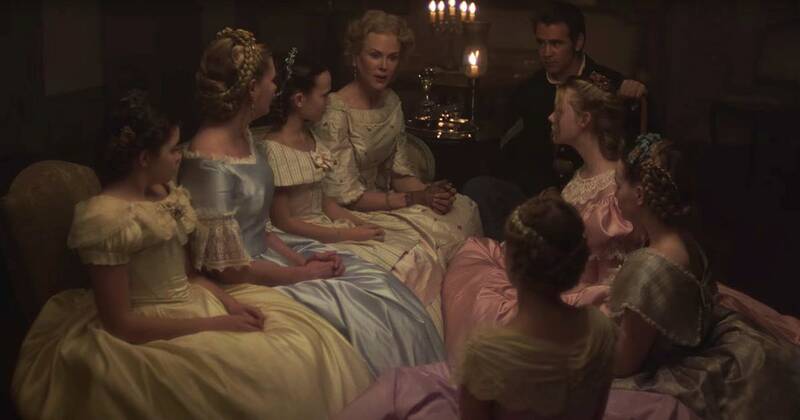 This has long been one of Coppola's core themes and The Beguiled bathes in it, politely, like any good Southern woman would. That tension ultimately turns against John, and Coppola goes somewhere she's never been before, which is horror territory. The stitching of nasty wounds somehow looks nastier against the gossamer backdrops, and the ladies' mannered banter takes a darker tone. Kidman's "Bring me the anatomy book! ", is worth a chill and a good laugh, one of many as the film teeters to a sinister conclusion. Her performance, as well as that of Farrell and the others, take on different layers. Revealed are levels of deception and devilry previously hidden during the French classes and sewing circles. When it all comes to light, Coppola's trademark restraint is understood and appreciated. For like the polite women of Miss Farnsworth's school, The Beguiled's genteel nature is just a way to lure you in.